This little red bud vase was once a hand soap dispenser in my bathroom. One day when I was washing my hands, the thought occurred to me that it looked like a vase. And after a little brainstorming this is what I came up with. What's great about this vase is you can put flowers in it. Often natural vases are for decorative purposes only. I could also visualize this done with jute string. Directions below. raffia or anything else you'd like to use like lace, string, ribbon, etc. 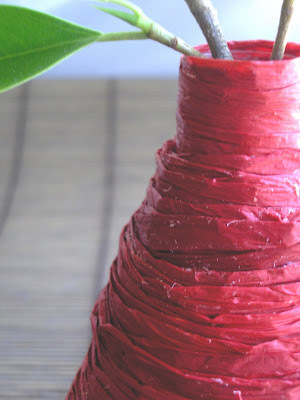 Glue the raffia to the top of the container. 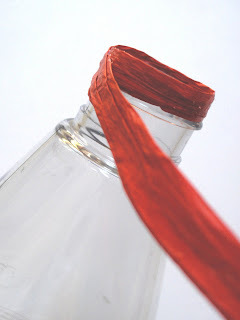 Wind the raffia around the bottle and glue as you go. While winding the raffia, have it overlap a little so none of the bottle shows through. Wind the raffia all the way to the bottom of the container. Done. Very cute. Seems like I did this as a kid, maybe girlscouts? Very fun idea. Might try this one. Hope you are having a great summer. really cool idea to recycle! 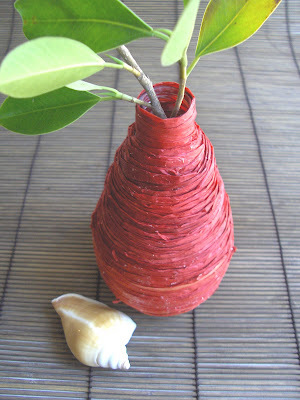 I have done something similar with terra cotta pots, wrapping them in jute cord, but never thought to wrap a bottle for a vase. Very clever! Neato! You come up with some of the most creative ideas and with lots of recycling in mind. Very clever! 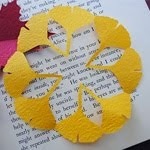 I will definitely be making some of these for gifts. Looks great and good for the enviroment. How cool! I love raffia. what a good idea! and I use that soap too! we used to wrap yogurt containers with colorful string when we were little. The green is so much in fashion . Yesterday i was seeing bags made of some recycled material and today this. Good to see all this. Cool idea, maybe I'll get a go at it too. Sound like fun to do. Great little project. Thanks for sharing. I like the concept! 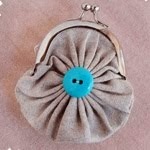 I like projects I can do very easily and without needing a lot of concentration. 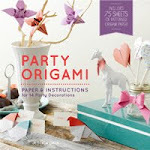 This is great, especially for gifts. What did you do at the bottom? Did you leave the plastic exposed so it would sit better (i.e. not tip over?) Can you show a picture of how you tied in the end? I wrapped the raffia all the way down to the point just before the bottle becomes flat. So yes, if you flip the vase upside down you can see the plastic. But when it's sitting on the table you can't tell.